To order or to receive more information, send us an or call us toll free at 1-800-350-8176. Timber Frame Tools is your North American representative for Krusi of Switzerland, serving the United States and Canada. 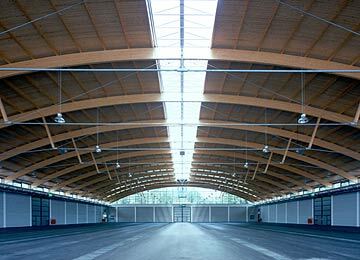 Exhibition halls built in Friedrichshafen, Germany, in 2002, with timberwork by Holzbau Amann GmbH and their LIGNAMATIC. 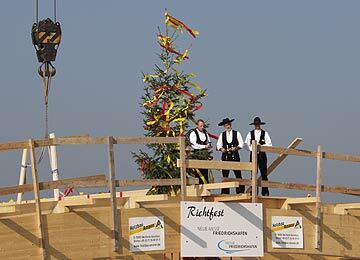 Using the LIGNAMATIC, Holzbau Amann specializes in unusually-shaped wooden structures from towers to churches. 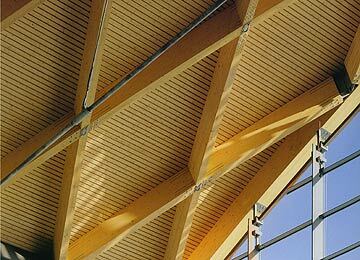 You can see many more projects on their website (in German only; explore the links under "Ingenieur Holzbau" for a variety of engineered wooden structures).